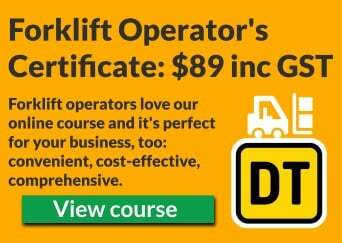 Home › Forklift › Can you use an Australian forklift licence in New Zealand? In general, forklift training in Australia is slightly more rigorous than in New Zealand. The courses are longer and cover a broader range of topics plus much more driving. However, operators are not required to do a refresher every three years like in New Zealand. An employer can accept evidence of an Australian forklift qualification at their own discretion. However, WorkSafe’s position is that anyone using a forklift in New Zealand should undergo refresher training using a New Zealand forklift course at the earliest opportunity in order to address any differences in legislation and operation. Employers may have their own health and safety requirements relating to the operation of forklifts on their premises and these could include the requirement to do a New Zealand course which covers the Approved Code of Practice. WorkSafe, formerly the Department of Labour, also says that if an operator provides proof (e.g. by certificate or other document) that they received formal training and assessment within Australia then New Zealand employers should accept this as recognition of prior learning and not preclude the operator from being employed. Note that this only applies to operating a forklift in a closed space, not on a road. An F endorsement is required for operating a forklift on a road and this requires a New Zealand driver’s licence (the endorsement is applied to the licence itself). The minimum age for an F endorsement is 18. ‹ How far should you be able to see ahead while driving?